The Compact SUV Made for Passionate Drivers. More Room to Cover More Road. 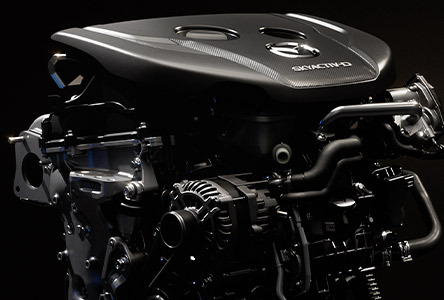 Powerful and Fuel Efficient Turbocharged Engine. Superb Handling with G-Vectoring Control Plus. Nimble yet spacious, the 2019 CX-5 exhibits a refined athleticism that lets you confidently navigate your world. Its tenacious and predictive available i-Activ AWD▲ technology gives you the power to enjoy the well-appointed interior and advanced infotainment system while keeping your focus fixed on the road ahead. 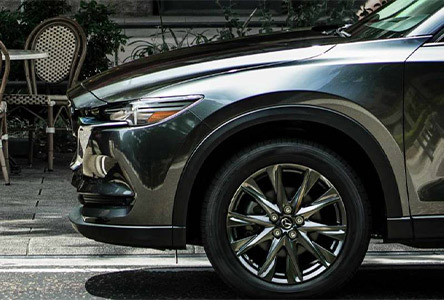 With its demanding stance and striking design, the 2019 CX-5 is a one-of-a-kind compact SUV with a presence that’s hard to ignore. Driving just got more powerful. New G-Vectoring Control Plus responds to your every turn. Experience the new options of the infotainment system for yourself. The new CX-5 Signature model comes with more refined, premium features. Brought to life by the hands of dedicated Takumi craftsmen, the CX-5 was clay modelled with Kodo design to exhilarate anyone who drives it and inspire anyone who lays eyes on it. Our new Signature model adds additional features, such as Nappa leather and Abachi wood trim. From black ice to dirt roads, i-Activ AWD▲ gives you the capability to take on virtually any terrain by surveying road conditions over 200 times per second. New Mazda Connect options, include available SiriusXM Traffic Plus and Travel Link▼ and standard Android Auto™. Alongside Apple CarPlay™, navigate the world around you using state-of-the-art technology and software. 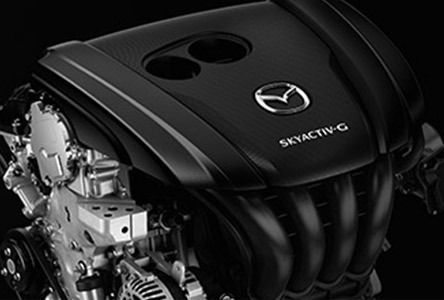 New to the 2019 CX-5 is the Skyactiv-G 2.5 T‡ turbocharged gasoline engine, designed to accelerate and brake intuitively while providing a smoother drive that responds to human sensibilities. Apple CarPlay™ gives you access to Apple Music™, Apple Maps, Siri and more from your iPhone. Android Auto™ integrates your music, phone calls, texts and emails with your vehicle for a safer drive. Elevate your drive with Nappa leather-trimmed upholstery, Abachi wood trim, 19” alloy gunmetal wheels and a standard 2.5 L turbocharged engine. Receive updates about major road incidents, construction and road closures, weather and local fuel prices. Includes complimentary 5-year subscription. Available on GT and Signature models. Predictive and reactive, i-Activ AWD▲ is capable of handling even the most adverse road conditions. The power lift-gate♦ offers easily programmable height settings. To help prevent items getting caught in the lift-gate, touch sensors are positioned on the inside left and right. By projecting critical driving information right within your line of sight, this innovative display helps keep your eyes focused on the road ahead. In models equipped with driver’s memory position, ADD enables drivers to quickly find the optimum driving position, even when switching between drivers. Custom designed for the 2019 CX-5, the 10-speaker Bose®▼ sound system delivers exceptional clarity, imaging and power for driver and passengers alike. The de-icer♦ uses heated wires along the A pillar and wiper finishing position to help clear the windshield quicker. Reduce rubber damage and improve visibility while driving. No more iced up wipers scraping your windshield! ‡Optional on the GT model and standard on the Signature model. ▲Optional on the GX and GS models and standard on the GT and Signature models. ♦Standard on the GS, GT and Signature models. ★When using AKI 87 regular gasoline. Maximum output with AKI 93 premium gasoline is 250HP @5,000 rpm.